I would like to share some awesome insight into the mind of a digital marketer. Here are a few things that I have been working on so far in Q1 for this website. I will also talk about some other areas I will be working on starting Q2 for this website. I wrote two blog posts that have done pretty well in Google search results so far. The first was how to block certain countries in Google Analytics and the second was how to block spam visits like semalt in Google Analytics. Another blog post that I wrote that had some solid Twitter action was how to use MailChimp and Wistia. Let’s look at the data first in Google Webmaster Tools to see what happened after the first two posts were written. Here, I can see that the blue line (impressions) jumped up pretty quickly in February 2015. This meant that the blog post was shown up higher to the top of page 1 on Google. The block countries post was published on December 24th, 2014 (technically end of Q4) and the block countries post was published on February 5th, 2015. The Mail Chimp / Wistia post was published on January 28th. 2015. We can take a closer look into Google Webmaster Tools to see a big spike was this keyword phrase. When I made this video, I really liked two sections that came out. The first section was at the start in Harvard Square with my friend Jeff. I used my steady cam for all of the shooting and I felt like this had the most feeling of being in Boston. My second favorite part came at the end when I was cooking with my roommate. I felt like this was such a unique part of the video. I was happy to see that the orange line chart was high for both sections. That meant that the audience was more engaged during these sequences. Here is some more interesting data below for this video that I would like to share. Here is a very small snapshot of some of the visits for the January 2015 video. Do you notice how some of the sections are in a yellow? 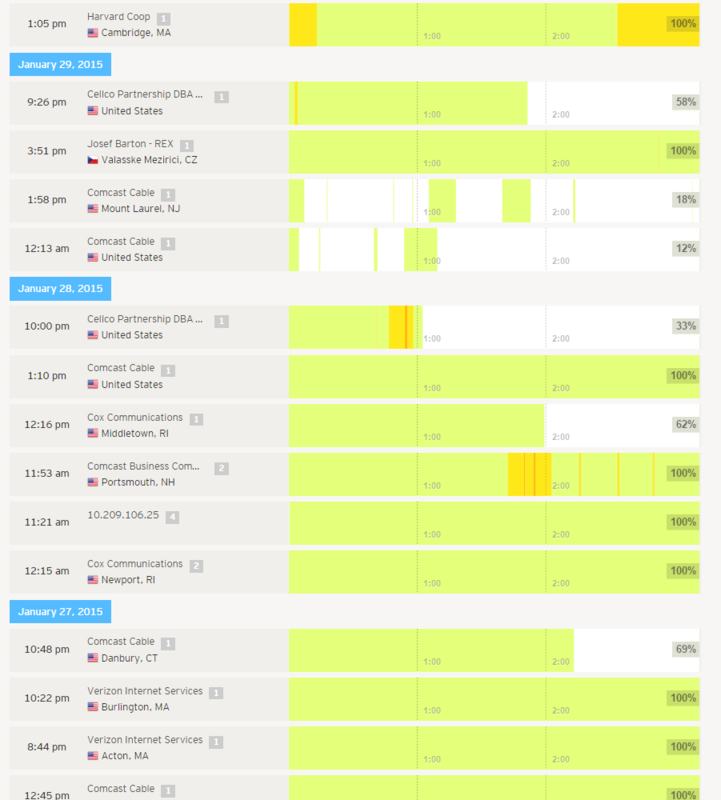 That means a higher engagement was seen during that time with either pausing or replaying that section by that user. I mentioned that I had some outreach programs go on for this video. Notice the very top visit was from Cambridge, MA from The Coop. That was from me emailing them about how I featured them in my video. What is interesting was that their part in the video came at the very start. You can see that the data tells me that they replayed their section that they were featured in. Obviously, I would too if someone emailed me about having my business featured in a video. What was also interesting was that they replayed the end section as well. They also played the entire video from start to finish which made it a 100% watched video. The visitor at 11:53 AM on January 28th was someone from the headquarters at Margaritas. I reached out to them via email and they even shared my video on their Facebook page. 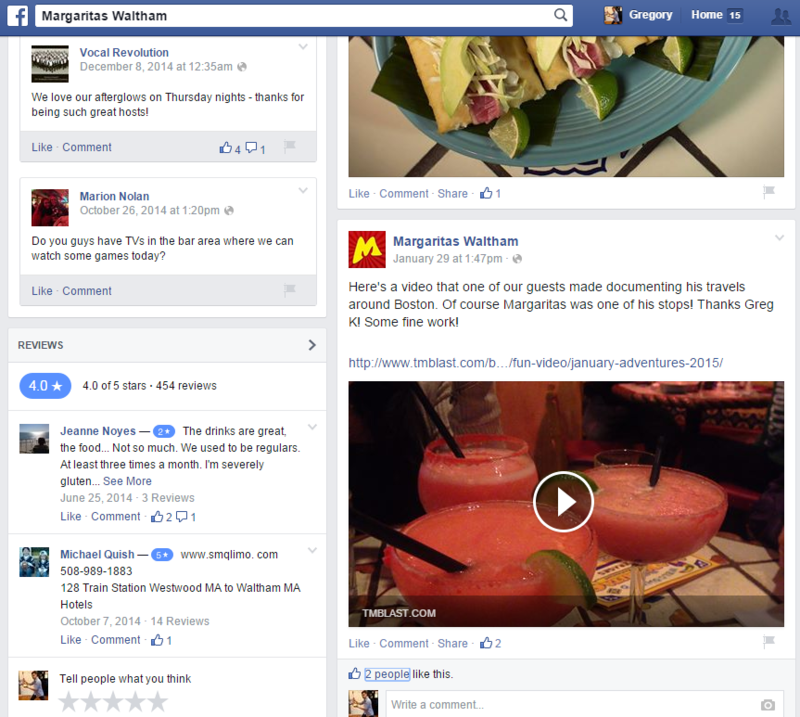 I can drill down to this user to see exactly where they replayed the part at Margaritas. You can see on January 29th my video was shared on their Facebook. This was something that was recommended by my roommate, Ward. He suggested that I take my videos one step further and set up event tracking in Google Analytics. 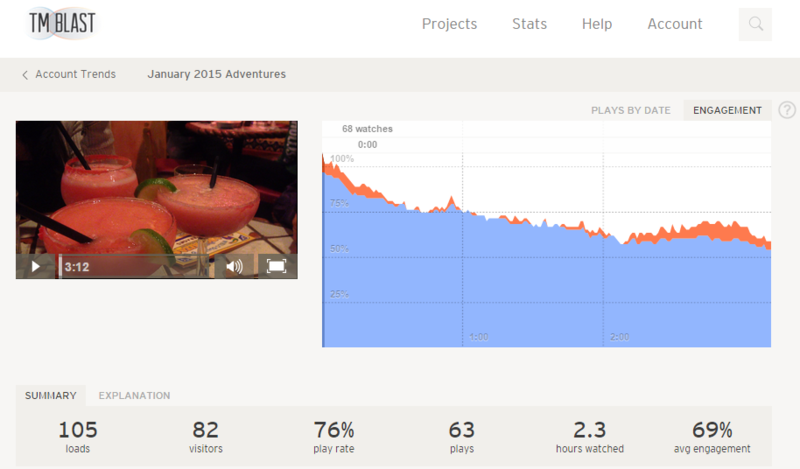 Once set up, I could see even more data on the videos for my website. I implemented this code tracking in quarter 1 of this year. Now, I can’t see the data if they just watched the video on Facebook, but if they came to my website, then I can combine the data from Wistia and Google Analytics. 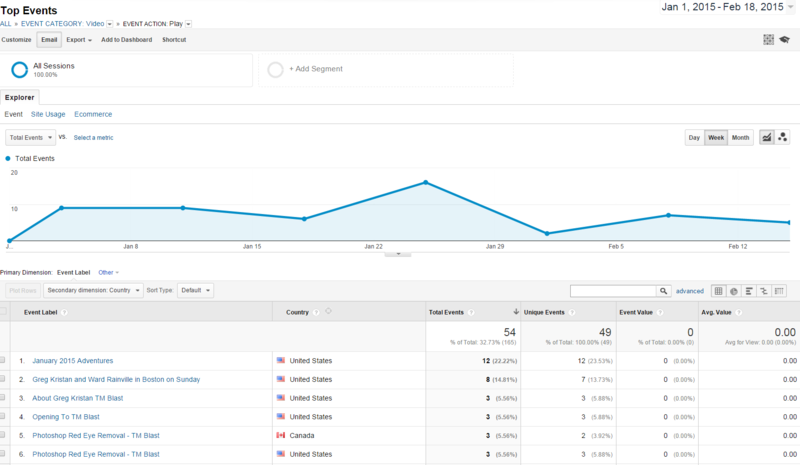 Here is the event tracking data in Google Analytics. I could drill down even further, but I want to keep this at a really high level for this blog. Some more event tracking data with the videos. I have this broken out by the source. This tells me where they came from to then watch my video on my website. 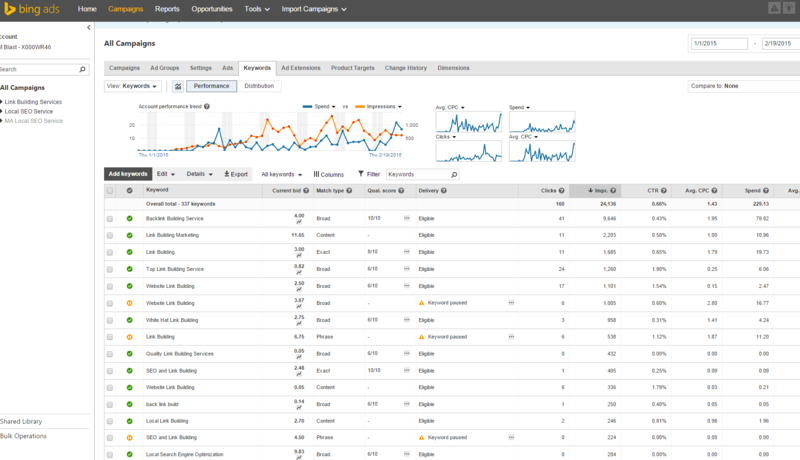 Here is the dashboard of Bing Ads. It might look pretty messy, but I have been really working hard in this dashboard to get even better at looking at the data. Bing Ads has been one of my favorite things of quarter 1. I attended this amazing webinar hosted by John Gagnon and I have been fully on board since. I was going to go to a Bing Ads conference in Boston, but the snow cancelled that for me. However, I hope to get out there later on in May or whenever they reschedule it. Bing Ads has allowed me to capture some amazing data at a fraction of the cost that Google AdWords would of cost me. I have been really putting my best effort into having my quality score high (see both above) and find ways to use the data from Bing and Yahoo to make better decisions for my website. Here is an example of what I use in Bing Ads that can go straight into my own website. 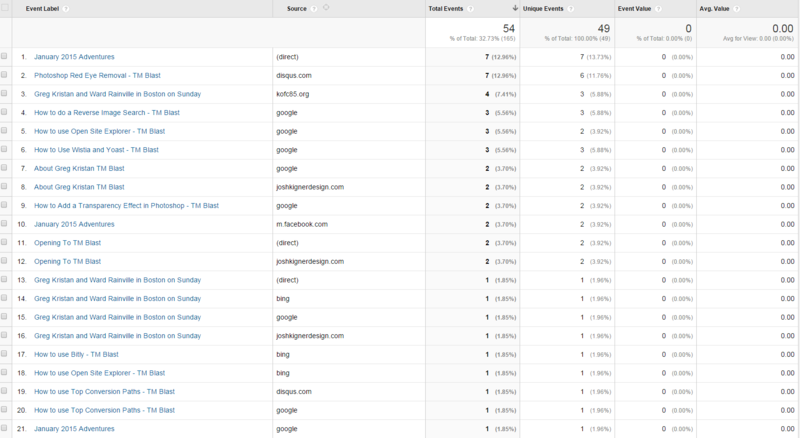 Now, I can see that Bing and Yahoo bring in about 9% of my organic traffic for quarter one so far. Yes, I am a big Bing fan, but I know that the numbers are just lower than Google by a long shot. I get it, but I use the data in Bing and Yahoo PPC advertising to see what terms I should be optimizing for organically based on search volume on that network. Here is some data that I can see in My Bing Ads dashboard. This is just from the keyword level for all campaigns. Stay tuned for a future guide on how to export the exact keywords in Bing Ads. Quarter 2 for me basically just builds off what quarter 1 was all about. However, I would like to discuss a few things that I am planning on doing and why. I will also talk about what I will not do for quarter 2 for this website. Dedicated PPC landing pages is something that I have wanted to do for awhile. What are the pros and cons of having this? Pros, I can really optimize my landing page for conversion rate optimization. I can have as much or as little (to a degree obviously) of content on this page. I can have a custom form fill that goes immediately to a dedicated thank you page so I can easily track one of these conversions. I can eliminate the menus at the top of the page so the user really only has two options. They can either leave or immediately feel out the form to continue. Here are some of the cons. More work for me. 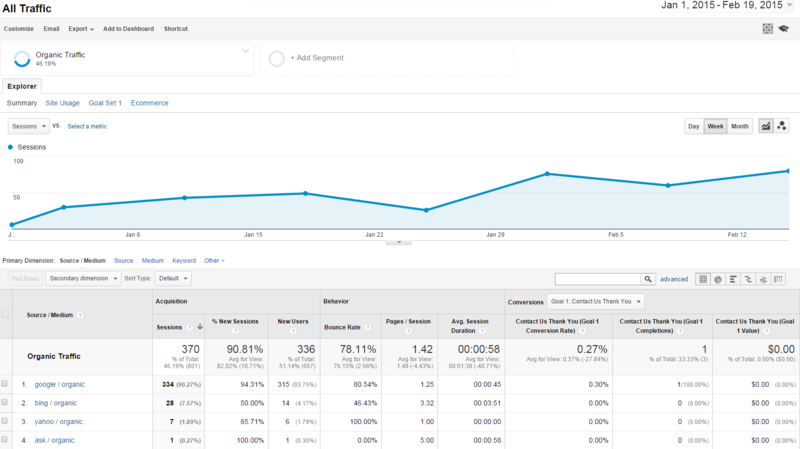 More custom tracking in both Google Analytics and Bing Ads. My quality score is pretty high for both campaigns so I don’t want to jeopardize it. I would like to make some more fun videos with my friends. I have some footage so far of NYC, the casino at Mohegan Sun, Wistia’s Party, and more. I would like to even shoot some more cooking videos with my roommate that will either only go on this website or potentially her own. When the weather gets better, I would also like to shoot more outdoor events and get really creative. I would also like to do even more editing in Adobe Premiere Pro. I had a lot of fun making that last video, so I would like to keep doing that. I would like to share some Excel for SEO projects that I am working on. I would also like to share some content about things that I have tested with actual data to show. Also, I would like to write more detailed post around all subjects of search marketing. There are two reasons why I would like to do this. First, I would like to improve the organic position for some of these pages on my site. A hosted video can help improve my rankings, but I just need to make the video. Second, I would like to see the data between a visit and a conversion. I would like to see (via my event tracking) if there is a connection between someone watching a video and filling out a form. On my list of things I would like to do, I would like to set up an email campaign using MailChimp. I would like to organically build my audience through monthly recap emails of blog posts or videos that were created. I will need to set this up in WordPress. I could even add an email turnstile to my Wistia video to capture more email leads. I can experiment this a lot with A.B testing to see what my goals are. Lots of A.B testing will continue throughout quarter one and quarter two. I would like to test different landing pages, videos, title tags, layout designs, email outreach campaigns, and more. I would then like to share some of this awesome data later on. I just don’t have the budget at the time to do this. The CPC (cost per click) for some of the words I am bidding on Bing is 4x or more expensive on Google. In a nutshell, I will actually have less data to use since I will be maxing out my budget with less searches and less clicks with my ads. Unless I start to drive some serious revenue to this website, I will not do this. This is just something I think does not make any sense for this blog. 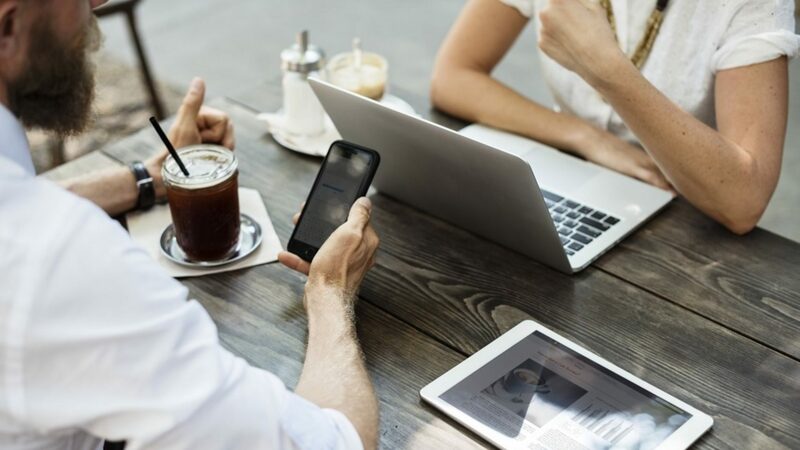 To do social media right, you need to be fully invested into it. I can’t spend my time into that, so I am choosing to ignore it completely. Yes, I know the benefits of social media. We have an amazing social media team at my full time job that absolutely helps not only build our brand, but also helps convert or assist in converting customers.